Surveyapp makes your surveys take off! 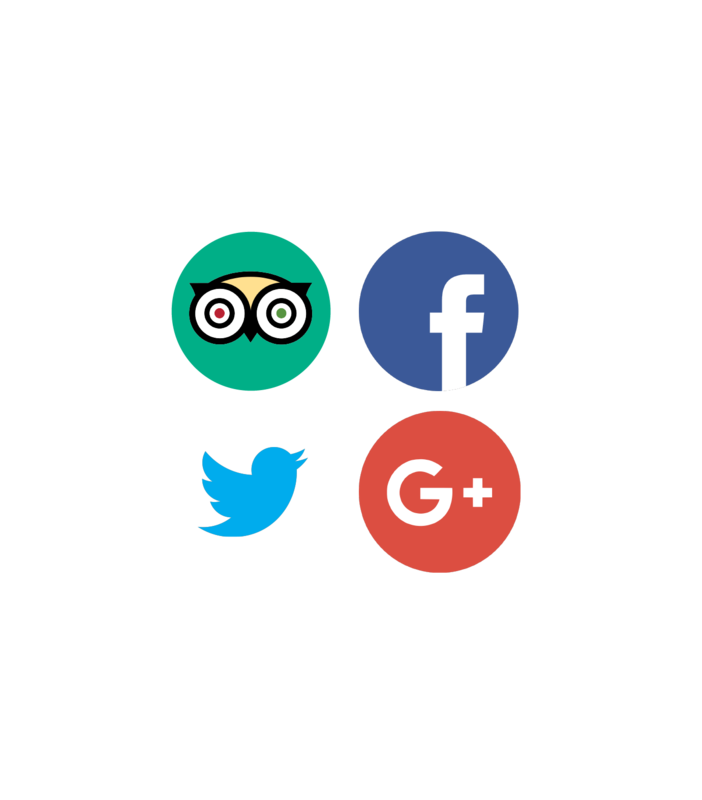 For travel and hospitality brands, happy customers are everything – and Surveyapp helps you make that happen. Surveyapp lets you gather the timely intelligence you need to build a loyal and happy customer base. Whether your business is airports or hotels, restaurants or trains, only the best customer experience will do. After all, it’s never been such a competitive world out there. Yet, too often, you only find out what your customers think when they post online after the event. How much better would it be if you could identify and fix any problems right at the touchpoint, before they’re broadcast to the world and become vocal detractors on social media and review sites? Well, Surveyapp lets you do just that. Offer customers the chance to tell you how they feel, while they’re still with you. Gain the clear, immediate insights you need to fix any problems, and do more of what your customers love. And give customers the pleasure of knowing you value their feedback. You’ll have averted a potential negative review – and gained someone more likely to recommend and come back to you. 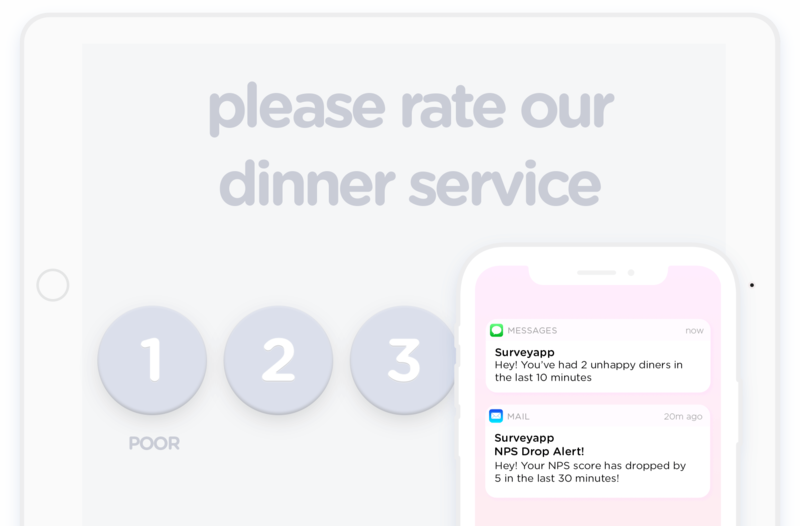 Did your customer enjoy their meal in your restaurant this evening? Did they find the ferry check-in process quick and painless? Was your train’s on-board catering service to their satisfaction? Whenever and wherever the customer engages with your hospitality or transport service, timely insights will help you keep everything on track. 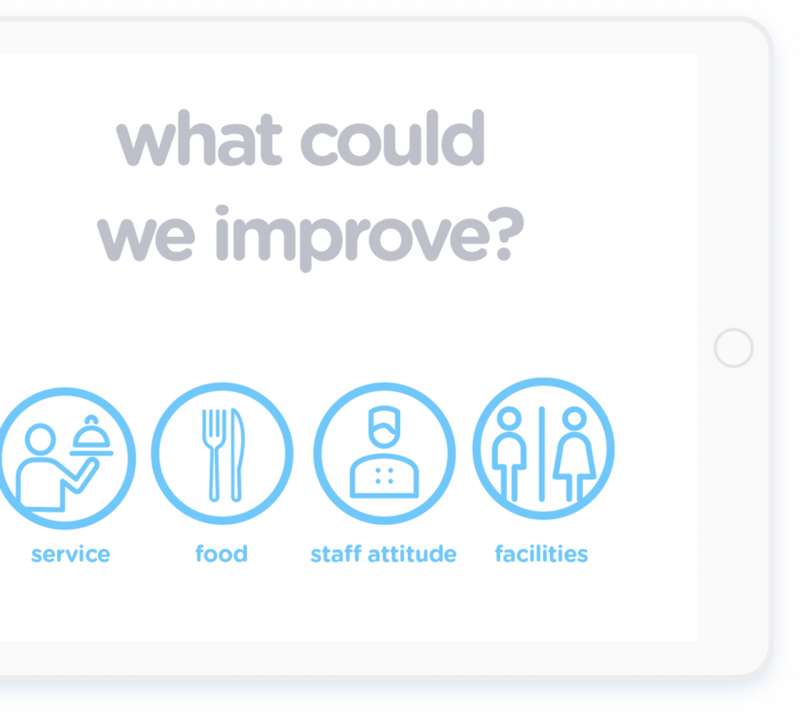 Gather feedback at the point of experience by tablet or via a survey terminal. Create surveys that make it easy for respondents to share their views – and that give you the insights you need to increase customer loyalty and repeat business. Measure and track customer loyalty using the widely recognised Net Promoter Score (NPS) metric, and target the improvements you need to drive business growth. 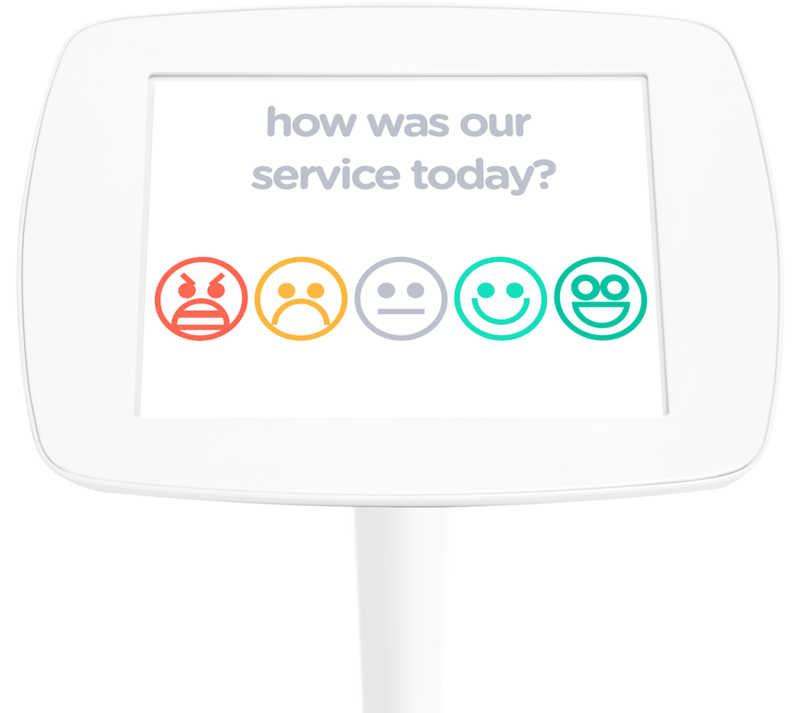 Ask Customer Satisfaction Score (CSAT) questions to find out how well you’re meeting or exceeding customer expectations today. Use the data to fix any glitches – and give praise to your team members where you can see they’re delighting customers. Overcome issues identified by Surveyapp, by using the analytics insights to quickly change elements of your service in real time. Let frontline managers experiment to see if new measures improve the service, as refreshed data is constantly delivered to your dashboard. Get real-time data delivered to your desktop or mobile device, with a dynamic dashboard that makes your analytics easy to follow and act upon. Got an issue that needs fixing right away? No problem. 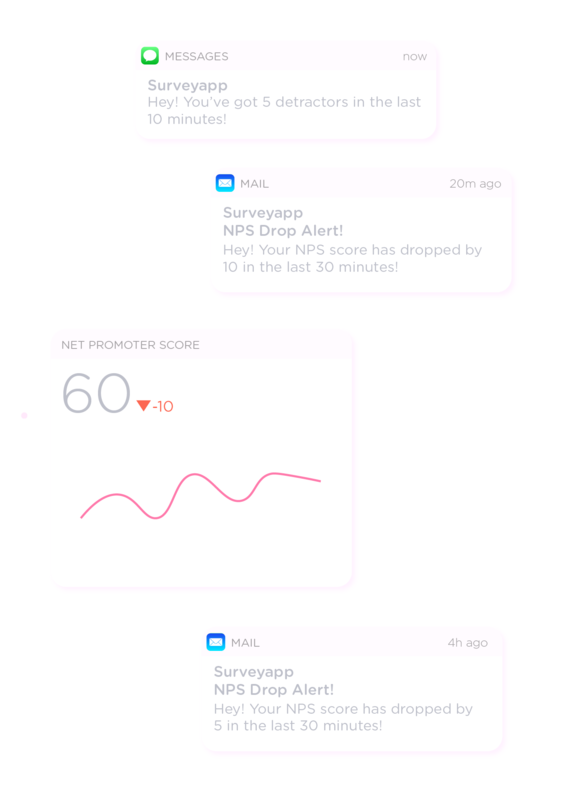 Surveyapp sends instant alerts so that your business can get straight on the case. Automated tracking of issues streamlines the follow-up process. Notify specific members of your team when they need to take action. And where you’ve collected contact information, use that to immediately put things right with unhappy travellers or guests. Much of the unstructured text data companies collect is never analysed or acted upon, but Surveyapp makes it easy to digest open responses. Advanced built-in text analytics let you identify key trends and priorities for action, quickly and without fuss.